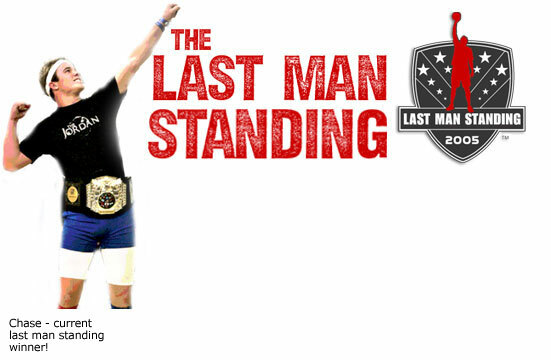 The World Championship ended with the most exciting event of the weekend, The NDL Last Man Standing Competition. All those who thought they had what it took entered the main court. Some tried to dodge, some tried to catch and some even tried to hide. As the playing field got thinner and the court got smaller, it came down to four guys who put on a heck of a show. It was a battle fought by many, but won by only one. Chase, a member of the All American Apostles, was able to out dodge the field of competitors and become the 2005 Last Man Standing winner. 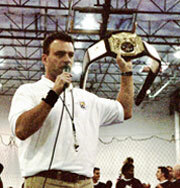 He not only gained bragging rights, he also received the coveted NDL championship belt. Bryan, show us your moves. A little support from friends. 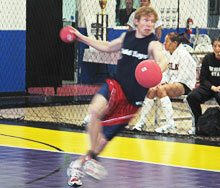 Planning has already begun for next year's Dodgeball World Championship. Don´t miss out, there will be more teams, more talent, and more fun. For more info fill out a contact form.